I never met a bread I didn't like. 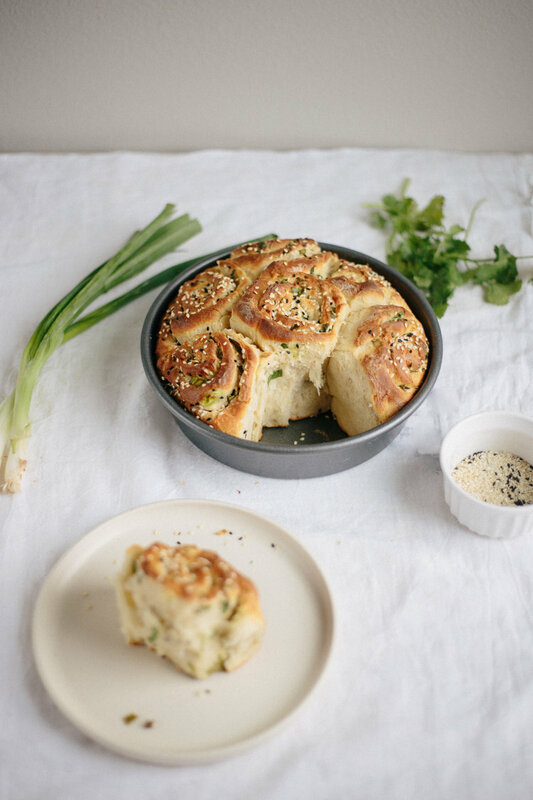 These challah rolls were no exception. 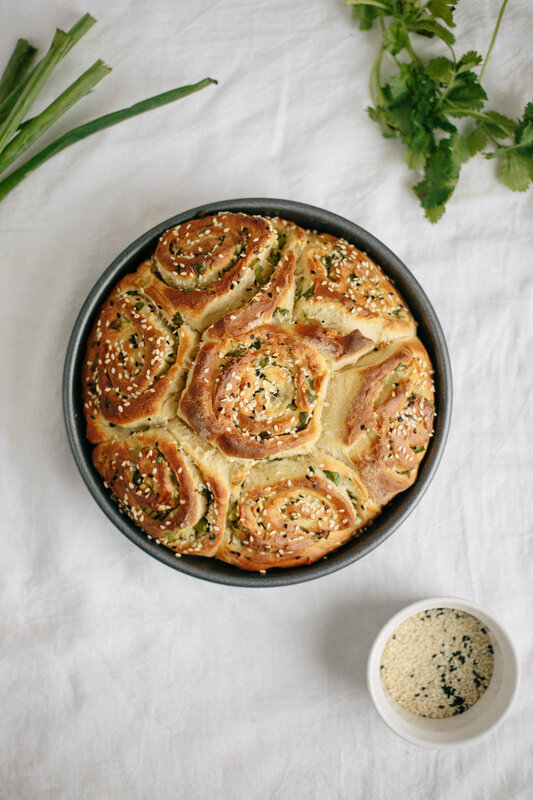 Soft, pillowy rolls stuffed with some of my favorite things: garlic, cilantro, scallions, and sesame seeds, were the perfect end to what started as a somewhat stressful day earlier this week. If somehow these could be made into magical pillows I would sleep on them every night, and hopefully dream of hot ovens and breads and pizza doughs and things. Is this getting weird? If somehow these could be made into magical pillows I would sleep on them every night, and hopefully dream of hot ovens and breads and pizza doughs and things. Is this getting weird? This week was pretty standard. Sibbie and I did our daily walks around and around the block--we even ran a couple of times! I went to work at Barnes and Noble twice to get out of the apartment, and feel like it is a really good fit for a new workspace every now and then. Usually I go to a nearby coffee shop or just work at my desk at home, but there is something about being around lots of books that inspires me. I've already mentioned that I hope to get back into reading again, and maybe frequent trips to a bookstore will help. I will never be able to read books off of a screen. I love holding it in my hands, studying the cover, flipping through the pages and then sometimes returning to the front and rereading a scene I might have previously overlooked. I'm old fashioned in a lot of ways, and books is one reason. Lately I've been thinking that my lack of reading has directly affected my writing skills. Because, sometimes, my mind goes completely blank when I sit down to write a blog post. I overthink things and wonder if it's interesting enough, witty enough, or funny enough. I think in circles and it all gets very confusing. Reading used to be a daily pastime. I used to fly through so many books, one after another (mostly historical fiction, fantasy, and poetry). I had a journal I wrote in daily, and even wrote my own (very amateur) poems. I miss studying words and writing, and this is another summer goal of mine this year, to get back into writing again. Writing was a major way I was able to make sense of feelings and thoughts in those teenage years, but now it is mostly done just by being in the kitchen. How do you like to unwind? I often turn to dough. Maybe it's too much Great British Baking Show or because bread is what dreams are made of, but the process helps me chill out and I love eating the results. How do you like to unwind? I often turn to dough. Maybe it's too much Great British Baking Show or because bread is what dreams are made of, but the process helps me chill out and I love eating the results. 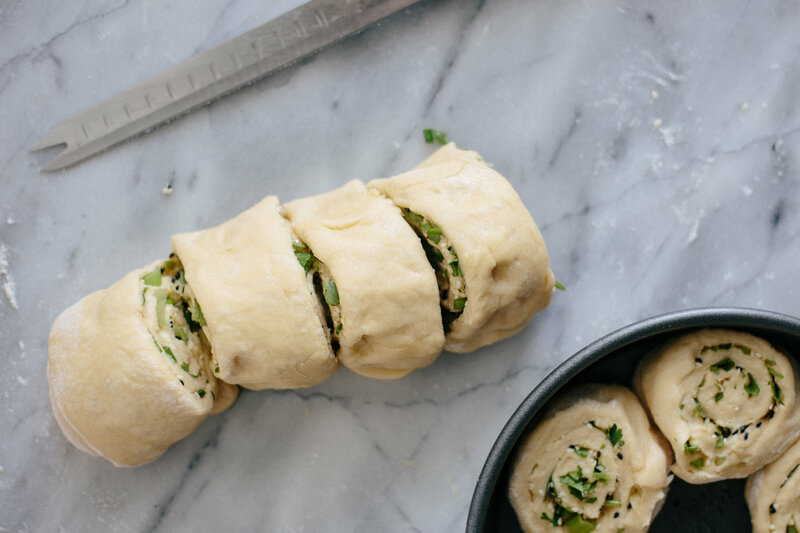 These challah rolls were inspired by Molly Yeh's scallion pancake challah. 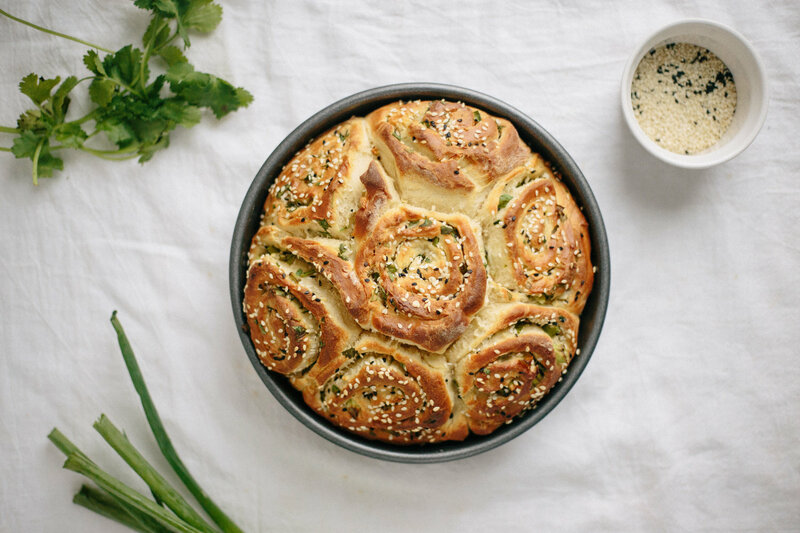 They are also extremely similar to the scallion pull apart bread I made last year, but these are a little softer due to it being a challah dough and it has a different overall flavor due to the cilantro and garlic. Cilantro is something I almost always have in my fridge and I love to put it in pretty much everything, along with fresh garlic because, well, garlic is a welcome addition to all things savory. You can opt to toast the sesame seeds beforehand but I did not here. Also, just note that these made 7 GINORMOUS rolls. If you'd like them to be a more manageable size for your dinner table, you can certainly cut the rolls smaller and have more at the end. The bread will rise quite a bit while baking, so keep this in mind. 1 tsp. sugar plus 2 tbl. 1. Pour 1/2 cup warm water into a small bowl. Sprinkle in the yeast and sugar, and stir to combine. Let sit until the mixture becomes bubbly at the top, about 10 minutes. 2. In a medium bowl, whisk together the eggs, oil, and honey. Set aside. 3. Combine the flour, salt, and remaining 2 tsp sugar in the bowl of a stand mixer fitted with the dough hook attachment. Add in the yeast mixture and the egg mixture, stirring to combine and scraping down the sides of the bowl. Knead on medium speed until dough is soft and smooth and slightly sticky. If dough is too sticky too handle, add in a little more flour. 4. Form dough into a ball and transfer to a lightly oiled bowl. Cover with plastic wrap or a towel and let rise until doubled in size, about 2-3 hours. 5. Preheat oven to 350°F. Lightly grease an 8" round baking pan. 6. Roll dough out onto a lightly floured surface until it is roughly an 18" x 9" rectangle. Drizzle with 3 tbl. 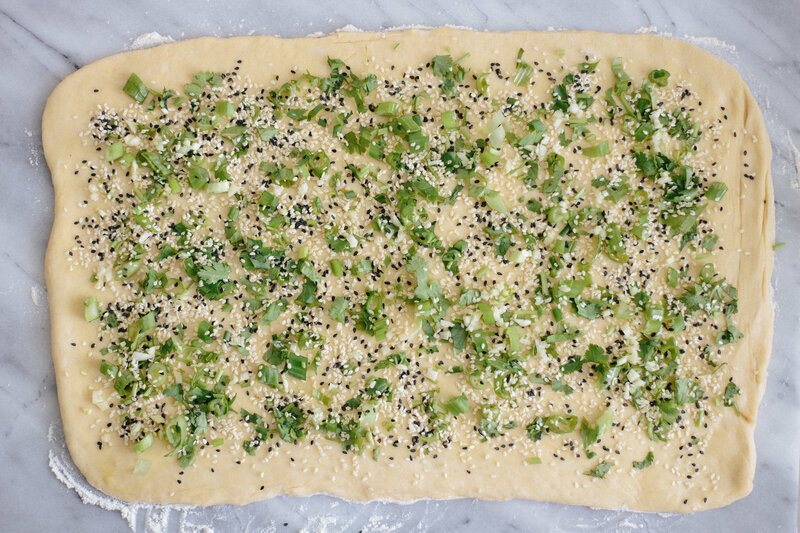 olive oil, then evenly sprinkle the cilantro, scallions, garlic, and sesame seeds on top. Working from the longer side, roll dough into a cylinder. Cut cylinder into 7-8 equal pieces. 7. 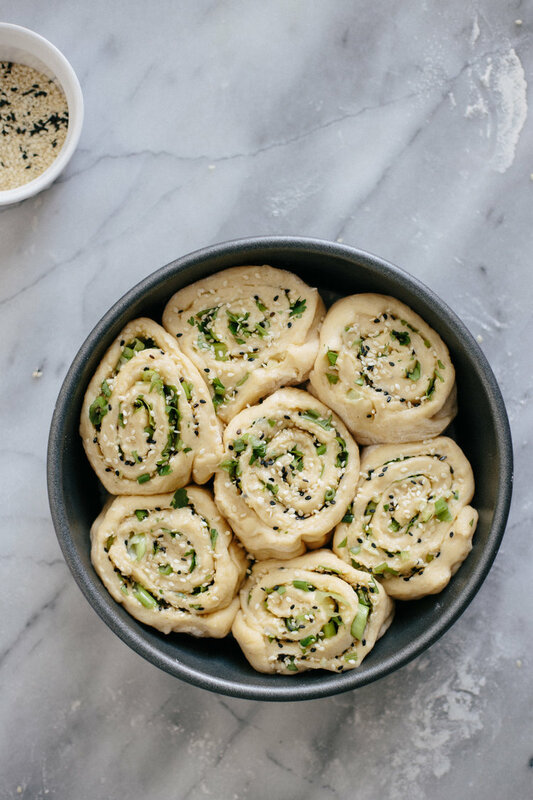 Arrange dough swirls into the baking pan, and drizzle with more olive oil and (optional) more sesame seeds. Bake for roughly 35 minutes, or until tops are golden brown.